For other uses, see Potosi. 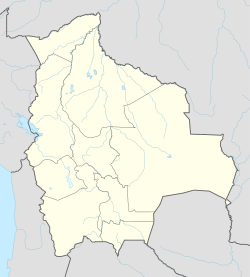 Potosí is a capital city and a municipality of the Department of Potosí in Bolivia. It is one of the highest cities in the world at a nominal 4,090 metres (13,420 ft). For centuries, it was the location of the Spanish colonial mint. Potosí lies at the foot of the Cerro de Potosí —sometimes referred to as the Cerro Rico ("rich mountain")— a mountain popularly conceived of as being "made of" silver ore that dominates the city. The Cerro Rico is the reason for Potosí's historical importance since it was the major supply of silver for Spanish Empire until Guanajuato in Mexico surpassed it in the 18th century. The silver was taken by llama and mule train to the Pacific coast, shipped north to Panama City, and carried by mule train across the isthmus of Panama to Nombre de Dios or Portobelo, whence it was taken to Spain on the Spanish treasure fleets. Some of the silver also made its way east to Buenos Aires, via the Rio de la Plata. Founded in 1545 as a mining town, it soon produced fabulous wealth, and the population eventually exceeded 200,000 people. The city gave rise to a Spanish expression, still in use: vale un Potosí, ("to be worth a Potosí") meaning "to be of great value". The rich mountain, Cerro Rico, produced an estimated 60% of all silver mined in the world during the second half of the 16th century. Potosi miners at first mined the rich oxidized ores with native silver and silver chloride (cerargyrite) that could be fed directly into smelting furnaces. Especially successful were the small clay “flower pot” furnaces called guayras, which had been used by the Incas. But by 1565, the miners had exhausted the direct-smelting ore, and silver production plummeted. Silver production was revived by the introduction of the patio process, invented in Mexico in 1557. The patio process used mercury amalgamation to extract silver from lower-grade ores, and those containing silver sulfide (argentite), as was typical of the unoxidized ores found deeper in the mountain. In 1609, another mercury amalgamation method, the pan amalgamation process was invented in Potosi, and proved better-adapted to the conditions at Potosi. Spanish American mines were the world's cheapest sources of silver during this time period. Spanish America's ability to supply a great amount of silver and China's strong demand for this commodity resulted in a spectacular mining boom. The true champion of this boom in the silver industry was indeed the Spanish crown. By allowing private-sector entrepreneurs to operate mines and placing high taxes on mining profits, the Spanish empire was able to extract the greatest benefits. An example of a tax that was levied includes the quinto, a 20% severance tax on gross value. From the raw materials extracted from the mines, coins called pieces of eight were fashioned at the Potosí mint. For Europeans, Peru–Bolivia was part of the Viceroyalty of Peru and was known as Alto Perú before becoming independent as part of Bolivia. Potosi was a mythical land of riches, it is mentioned in Miguel de Cervantes' famous novel, Don Quixote (second part, chap. LXXI) as a land of "extraordinary richness". One theory holds that the mint mark of Potosí (the letters "PTSI" superimposed on one another) is the origin of the dollar sign, although the likelier origin of the symbol is the $-shaped scroll-wrapped columns on the reverse of the Spanish dollar. By the early 17th century, Basques were well established in the city and made up for a substantial number of the inhabitants in Potosí. They gathered in a confederation opposed to another one, the Vicuñas, a melting pot of natives and non-Basque Spanish and Portuguese colonists, fighting for control over ore extraction from the mines and its management. Eventually, tension among both factions came to a head, resulting in the eruption of overt armed conflict starting 1622 up to 1625. The Spanish Crown intervened, siding at one point with the Basques. Finally, both factions reached a settlement sealed with a wedding between the son and daughter of the leaders in either side, the Basque Francisco Oyanume and the Vicuña general Castillo. Native-American laborers were conscripted and forced to work in Potosí's silver mines through the traditional Incan mita system of contributed labor. Many of them died due to the harsh conditions of the mine life and natural gases. At such a high altitude, pneumonia was always a concern, and mercury poisoning took the lives of many involved in the refining process. According to Noble David Cook, "A key factor in understanding the impact of the Potosi mita on the Indians is that mita labor was only one form of work at the mines. A 1603 report stated that of 58,800 Indians working at Potosi, 5100 were mitayos, or less than one in ten. In addition to the mitayos there were 10,500 mingas (contractual workers) and 43,200 free wage earners. Yet mitayos were required to do the work others refused: predominantly the transport of the ore up the shafts to the mouth of the mine." From around 1600, the death rate skyrocketed among the local Indian communities. To compensate for the diminishing indigenous labor force, the colonists made a request in 1608 to the Crown in Madrid to begin allowing the importation of 1,500 to 2,000 African slaves per year. An estimated total of 30,000 African slaves were taken to Potosí during the colonial era. Like the native laborers, they too died in large numbers. African slaves were also forced to work in the Casa de la Moneda (mint) as acémilas humanas (human mules). Since mules would die after a couple of months pushing the mills, the colonists replaced the four mules with twenty African slaves. During the Bolivian War of Independence (1809–1825), Potosí frequently passed between the control of Royalist and Patriot forces. Major leadership mistakes came when the First Auxiliary Army arrived from Buenos Aires (under the command of Juan José Castelli), which led to an increased sense that Potosi required its own independent government. When the Second Auxiliary Army arrived (under the command of Manuel Belgrano). When the Second Auxiliary was forced to retreat, Belgrano made the decision to blow up the Casa de la Moneda. The natives undid the fuse, as many refused to evacuate and would have lost their lives. Two more expeditions from Buenos Aires would seize Potosí. "This doubtless must have much silver in its heart"; whereby he subsequently ordered his vassals to go to Ccolque Porco ... and work the mines and remove from them all the rich metal. They did so, and having brought their tools of flint and reinforced wood, they climbed the hill; and after having probed for its veins, they were about to open those veins when they heard a frightening thunderous noise which shook the whole hill, and after this, they heard a voice which said: "Do not take the silver from this hill, because it is destined for other masters." Amazed at hearing this reasoning, the Incan vassals desisted in their purpose and returned to Porco and told the king what had happened; relating the occurrence in their own language, on coming to the word noise, they said "Potocsí" which means there was a great thunderous noise, and from that later was derived (corrupting a letter) the name of potosí. It is believed[who?] that "Potosí" is a Quechua word. However, in Quechua the phoneme p'otoj does not refer to a thunderous noise, whereas it does in Aymara. Thus, if Potosí encompasses the idea of a thunderous noise, the locution would have an Aymaran root rather than a Quechuan. The actual sharp structure of the term is contrary to the nature of both Aymara and Quechua. 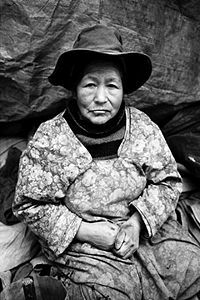 Another explanation, given by several Quechua speakers,[specify] is that potoq is an onomatopoeic word that reproduces the sound of the hammer against the ore, and oral tradition has it that the town derived its name from this word. Potosí with Cerro Rico in the background. Potosí features a rare climate for a city of its size, due to its extreme elevation at over 4000m. Semiarid and with average temperatures in its warmest month sitting right on the 10 °C threshold, the city's climate straddles that of the subtropical highland climate (Cwc, according to the Köppen climate classification), with subpolar oceanic characteristics and an alpine climate (E). Summers are cool and wet with daily highs rarely rising above 20 °C, while winters feature cooler days with much colder nights averaging −4 °C. These low temperatures are a result of the extreme precipitation deficit during the winter months with the resulting aridity leading to an increased diurnal temperature variation. Potosí is home to football team Club Bamin Real Potosí, who play their matches at the 32,000-capacity multi-purpose stadium Estadio Víctor Agustín Ugarte, one of the highest stadiums in the world. The city is served by Aeropuerto Capitán Nicolas Rojas, with commercial airline flights by Boliviana de Aviación, Bolivia's flag air carrier. The city of San Luis Potosí in Mexico was named after Potosí in Bolivia. In the United States, the name Potosi was optimistically given to lead-mining towns of Potosi, Wisconsin, and Potosi, Missouri, and also to the silver-mining town of Potosi, Nevada. Potosi, the first image in Europe. Pedro Cieza de León, 1553. Potosí Cathedral under restoration works. A street in Potosí with Cerro Rico in the background. ^ "World Gazetteer". Archived from the original on 2013-01-11. 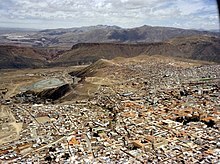 ^ Bolivia & Main Cities / Potosí from boliviaweb.com. Retrieved 2010-09-27. ^ Tutino, John (2017). The Mexican Heartland: How Communities Shaped Capitalism, a Nation, and World History, 1500-2000. Princeton University Press. ^ Kritzler, Edward (2008). Jewish Pirates of the Caribbean. Anchor Books. p. 151. ISBN 978-0-7679-1952-4. ^ a b Flynn, Dennis; Giráldez, Arturo (1995). "Born with a 'Silver Spoon': The Origin of World Trade in 1571". Journal of World History. University of Hawai'i Press. ^ Ronald D. Crozier, “Silver processing in Spanish America; the patio process and beyond,” CIM Bulletin, July-Aug. 1993, v.86 n.972 p.86-91. ^ "BBC - A History of the World - About: Transcripts - Episode 80 - Pieces of eight". Retrieved 2016-05-07. ^ Cook, Noble David (1981). Demographic collapse, Indian Perú, 1520-1620. Cambridge University Press. p. 237. ISBN 0-521-23995-8. ^ "Climate Data and Activities". WeatherWorldOnline. Retrieved 15 October 2013. ^ "Potosi [origin of place name]". Wisconsinhistory.org. 1941-10-10. Retrieved 2010-04-13. Bakewell, Peter. "Miners of the Red Mountain: Indian Labor in Potosi, 1545-1650". University of New Mexico Press 2010. Bakewell, Peter. "Silver and Entrepreneurship in Seventeenth-Century Potosí: The Life and Times of Antonio López de Quiroga". Southern Methodist University Press 1995. Gil Montero, Raquel. "Ciudades efimeras. El ciclo minero de la plata en Lipez (Bolivia), siglos XVI - XIX". Instituto Frances de Estudios Andinos - IFEA- Plural Editores, 2014. Tandeter, Enrique. "Coaccion y mercado. 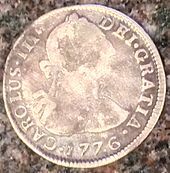 La mineria de plata en el Potosi colonial, 1692-1826". Siglo XXI Editores 2001. Wikimedia Commons has media related to Potosí. Wikivoyage has a travel guide for Potosí.